Our Top 5 Mattress Reviews for Arthritis Relief – as Recommended By You! Experts say insomnia is common among the 54.4 million arthritis sufferers in the United States and nearly two in three experience trouble sleeping. However until very recently, scientists discovered that joint pain causes sleep disruption and being sleep-deprived worsens joint pain causing a further acceleration in joint damage. Choosing a mattress that gives you the comfort you need can be a great challenge but it can help to treat insomnia which ultimately could lead to an improvement in the condition. On this note, people that suffer from osteoarthritis, rheumatoid arthritis or fibromyalgia need a mattress that not only offers comfort but helps alleviate the pain. That means getting one with excellent support for the spine, neck, shoulders and other pressure points, is a must. Here are excellent choices of mattresses that are best suited for people with osteoarthritis (wear-and-tear arthritis) and rheumatoid arthritis (immune system is attacking the joints). If you’re curious about the best mattress for arthritis relief, Loom &Leaf has the best reviews in 2018 with the highest owner satisfaction. If you’re looking for a mattress to alleviate back pain, morning stiffness and to get relief from the pain and stiffness of osteoarthritis, start with these options. This section was not an easy section to write since there are many good quality mattresses on the market as well as so many different price variations. We’ve narrowed it down to the top 5. These are the best and most comfortable pain-relief mattresses (organic, foam, hybrid, innerspring etc.) on the market all with incredible reviews and high ratings. We hope this bestseller list helps. If you can afford I would highly recommend trying Loom & Leaf . Saatva is a top name in the industry and this hand-crafted, American-made mattress made by them, features a 5lb. density memory foam design that seeks to bring comfort and luxury to your bedroom. It is best comparable to the quality level of the iComfort and Tempur-Pedic® mattresses, however for a lot less money. The Loom & Leaf 12″ visco-elastic memory mattress by Saatva has a top organic cotton cover that ensures you are comfortable and safe. Also, the cover is treated using a botanical antimicrobial fabric treatment to prevent the growth of bacteria. This, in turn, improves the quality of the cover to last an extended period. The mattress has a COOLING GEL panel which is designed to keep you fresh when you sleep. The panel also has a significant benefit of adding on to the overall support of the mattress. That is by distributing weight evenly and proper alignment of the spine for pain relief. The mattress comes in two firmness levels including the Relaxed-Firm and the Extra-Firm. The Relaxed-Firm lies between not-too-hard and not-too-soft, and is suitable for most sleeping positions. The extra firm is ideal for people that require additional support for pressure points pain relief. It’s available in 7 sizes, all sizes are 12″ high and comes with a 15-year warranty. This American-made mattress is made from 100 % natural latex that is known for its superior quality and outstanding support. 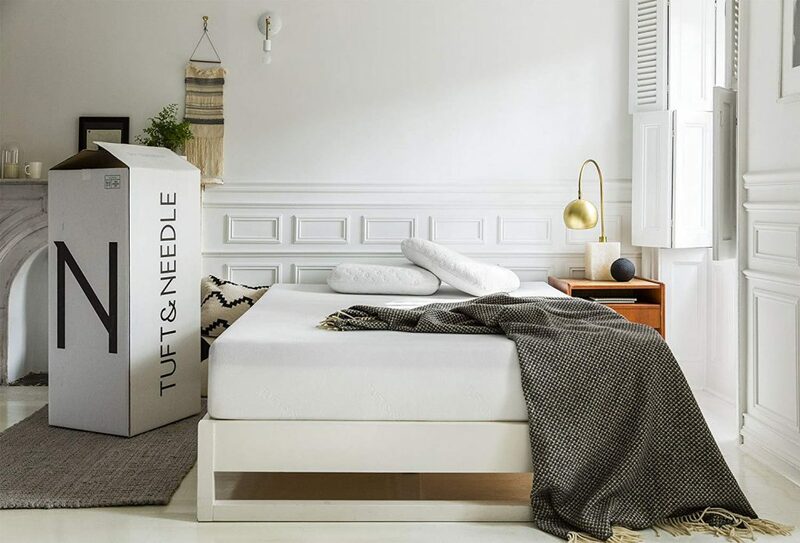 The mattress utilizes organic fabrics to ensure you sleep safe and comfortable all night long. There are no synthetic foams used and the mattress is hypoallergenic which naturally resists the growth of molds and other microbes. The base layer of the Zenhaven latex mattress has support cores which are made of 100 % TALALAY LATEX for the extra support and comfort. The comfort layer has a five-zone design that provides the extra firmness of the mattress. This is essential for excellent spinal support and ultimate comfort. On the top of these layers is an organic wool layer that is flame retardant to ensure the mattress is safe. Also, the top woolen cover contributes to the breathability of the mattress keeping you fresh and comfortable all night. It wicks out excess moisture and the heat away from your skin giving you the comfort you need most. Available in six sizes and comes two comfort layer options to choose from: Gentle Firm and Luxury Firm. 80% of the sleepers choose the latter for maximum relief and comfort. Zenhaven also features a 120-night trial and a 20-year warranty (+ free mattress removal). The adaptive foam used to make the mattress gives it a soft bounce (like an egg-crate foam mattress) but a supportive base to provide you with the comfort and support you need if you’re an arthritis sufferer. Thus, it’s a great mattress for all sleepers including back, side and stomach sleeping positions. The materials used are of premium quality and are designed to last a long time. The American made 10″ Tuft & Needle memory foam mattress does not cause heat retention. Owing to the HIGH-QUALITY ADAPTIVE FOAM, it’s not a heat trap like memory foam and the top, breathable cover helps you sleep cool all night. It does this by wicking away heat and moisture from your skin to sleep fresh and dry all night. With this, you wake up the next morning feeling refreshed and energized. One more benefit of this mattress is the excellent support it offers. It does not feel too soft to sink in and too hard to distract from your sleep. It is the perfect combination of soft and hard to offer you the ultimate support and to allow you to wake up refreshed every morning with less stiffness and pain. This also ensures the right spinal support relieving you from pain in the neck, shoulders and the back. The mattress is available in six sizes and at a bargain price. There’s also a 10-year warranty and a 100-night trial to make sure it’s the right relief-mattress for you. 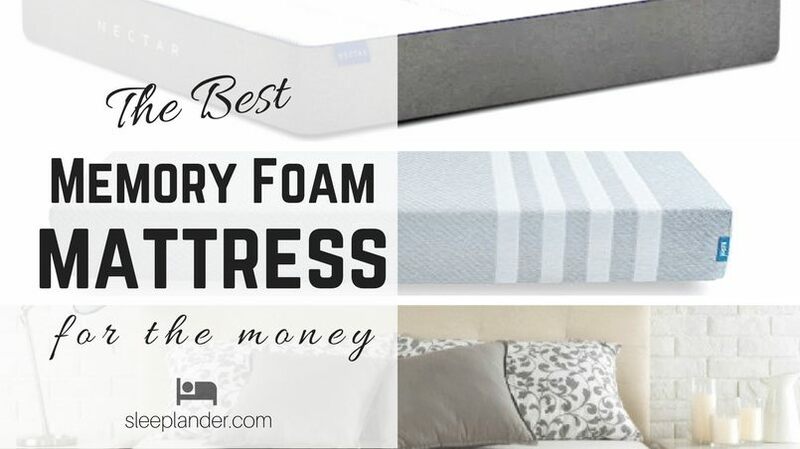 The Alexander Hybrid Mattress from Nest Bedding is an accurate definition of comfort, support and luxury featuring both foam and pocket spring coils. It combines multiple layers of quality materials to ensure a long-lasting experience of relaxation. On this note, the mattress has seven inches of pocketed coils which add on to the support of the mattress at the base and offers excellent edge support. The top layers of Quilted, Gel and SmartFlow foam provide the soft bounce needed for comfort while giving you the right support for pressure relief. You won’t get that “sink deep into” feeling that you get with foam because of the “hybrid” feature. The cool stretching fabric on top means you won’t have to worry about heat retention and that’s also thanks to the COPPER-INFUSED foam and the coils. Also, it is breathable enough to wick away moisture from your skin allowing you to sleep comfortably. It is designed with a high firmness level to provide the support needed for people that suffer from pressure points pain and the HYBRID FEATURE helps with the contouring and hugging of the natural curves of the body. It gives the body the right bounce while providing the base support. Indeed, it is a piece of luxury, support and comfort all merged into a single mattress. It is the copper-infused foam that makes this mattress stand out above the rest. Choose between Medium-Firm (5-6/10 on a firmness scale) or Luxury-Firm (8/10 on a firmness scale). Finally, the 13″ mattress is available in a range of 8 sizes and features a 20-year warranty along with a 100-day sleep trial. 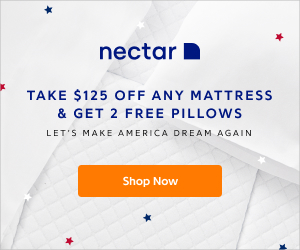 Coupon: Nest are offering Sleeplander readers 5% off with code: NEST5 when purchasing directly from Nest Bedding website. Just use this link to get started. If you like sleeping plush, you’ll love the feeling of the hybrid 15″ DreamCloud mattress featuring latex, memory, tufting and coiling technology making it one of the best regarding support and comfort. 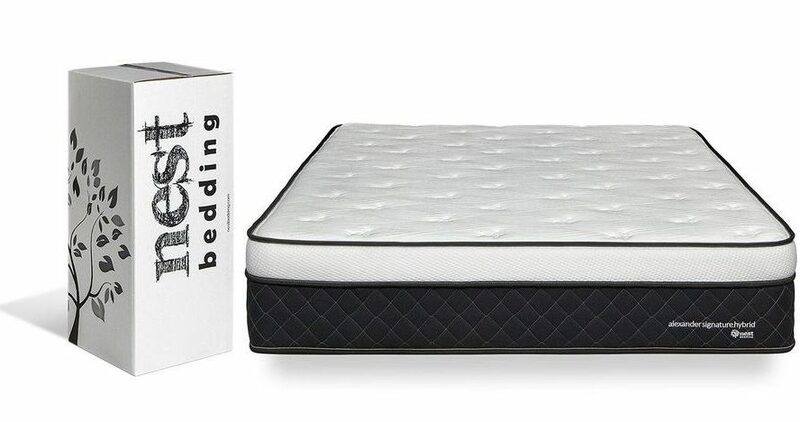 It has five unique comfort zones with the coils that provide the exact level of support for a comfortable night. This design ensures the proper spinal alignment relieving all the weight from the neck shoulders, back, and feet. The gel infused memory foam layer comes with double benefits. One, it ensures the mattress conforms to your body, so each part is well rested. Secondly, it helps in the distribution of weight all over the mattress which considerably reduces pressure from the back and feet. This feature makes it suitable for people that have arthritis and other related illnesses. The top cover of the mattress is designed to give you a soft feel while protecting the underlying layers. The top brings about a luxury you have not had before and will lure you to sleep earlier and faster and keeping you asleep. Also, it is highly breathable, so you do not have to wake up drenched in sweat from the excessively hot conditions. Finally, it features a free 365 NIGHT TRIAL, 6 months low payment, EVER-LONG warranty, free shipping and return policy. It is clear that one of the crucial factors to look for when choosing a mattress for pain relief is support. The mattress should provide excellent back support by ensuring proper alignment of the spine. This will, in turn, take away the weight from the pressure points helping you to sleep better and wake up relaxed. These are the top picks; hopefully, you get to choose a suitable one. To support our work we earn a commission if you buy through some of the links listed below at no additional cost to you. This doesn’t influence our opinions, but we believe in full disclosure so you can make informed decisions. Read more here.